People tuned into the Ed Sullivan show to watch Elvis and the Rolling Stones, Maria Callas and the Beatles, but also for his less famous acts—acrobats, plate spinners, prizefighters, a rubber mouse puppet, tap dancers and musicians, and ventriloquists galore. In this Weekend Edition interview from NPR, Gerald Nachman, author of Right Here on Our Stage Tonight! 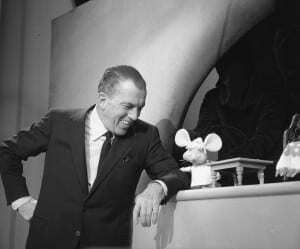 talks with Scott Simon about how Sullivan’s mouse friend Topo Gigio helped endear the awkward host to his most vicious critics, and the Sullivan favorites that turned the show from a stage for the famous to a reflection of America, and then changed popular culture forever.